The marriage rite now found in the Roman Ritual is to be revised and enriched in such a way that the grace of the sacrament is more clearly signified and the duties of the spouses are taught. So, in part, the intent is to catechize the couple through the ritual. “If any regions are wont to use other praiseworthy customs and ceremonies when celebrating the sacrament of matrimony, the sacred Synod earnestly desires that these by all means be retained” (Council of Trent, Session XXIV, November 11, 1563, On Reform, chap. I. Cf. Roman Ritual, title VIII, chap. II, n. 6.). 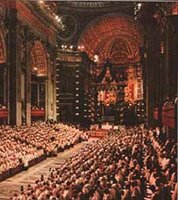 A substantial freedom is granted to conferences of bishops. They are empowered to draw up their own Rite of Marriage within the bounds of previous council teaching on authority outside of Rome. We’re still waiting for the latest revision of the Rite of Marriage. With all the fuss on the Roman Missal, this one has been buried for over a decade. This brings to mind a comment from a very-PC Catholic years ago. He objected — almost violently — to the notion of praying for our enemies because he believed the act of identifying anyone as an enemy was utterly incompatible with being a Christian. Let’s just say we did not come to consensus…. 2. The end of the limitation on Mass being celebrated after noon. That said, I am a strong proponent of morning weddings. It’s sad they’ve become so rare.